I just finished an order for 2 dozen of my beadhead caddis pupa, and was realizing that I haven't mentioned any flies for awhile. As we get into summer, make sure you have plenty of terrestrials if you are planning on fishing the Smokies. My favorite combination is a green weenie and ant fished with a couple of split shot in the faster pockets and runs. The fish will kill an ant when nothing else seems to work. Also, the Isonychias should be around now, and I have a couple of great patterns for this hatch. 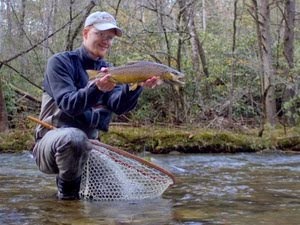 My favorite is a soft hackle pattern that has produced some of the largest fish I've caught in the Smokies including a 19 inch brown and 16 inch rainbow. Fly fisherman in middle Tennessee have experienced the pinnacle of terrestrial fishing here in the southeast this summer. The cicadas have been nothing short of spectacular as the 13 year periodic cicada hatch produced many opportunities to take large fish on dry flies. 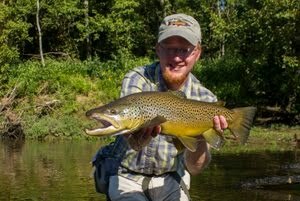 I never got on the big browns like some people but caught nice browns and rainbows up to 19 inches. The carp fishing was insane, and I finally figured out why some people are so enamored with this species. 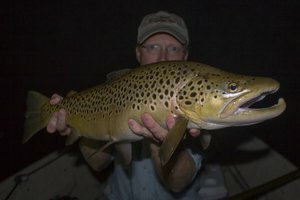 I floated the Caney a few times including a couple of trips with David Perry who has spent the summer putting clients onto big fish using dry flies on multiple area tailwaters. The first trip was absolutely incredible but it was the carp fishing that really got us excited. 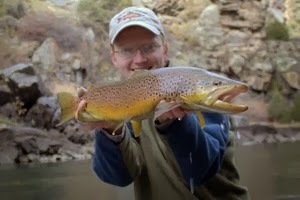 Early in the float David P. nailed a big brown that was 22 inches on a cicada. That got our hopes up for more big fish, but the next few hours were slow with just a handful of fish to the net. As we moved further down the river, we started seeing large fish cruising the dead water along the banks and feeding on the surface. My first cast to one of these surface feeders was long, probably 60 feet, but the fly landed on target and the fish sipped the big cicada pattern. Upon feeling the steel, the fish promptly ran into a tangled mass of logs and broke the 4x like nothing. Since then I've used nothing lighter than 3x. Thankfully that wasn't the end of my day. Continuing down the river, I soon got another shot at a carp and shortly had my first ever carp pictures. David P. wanted in on the action so I rowed for awhile while he fished to more rising carp. Neither of us had ever experienced anything quite like it and were having a blast. My largest fish of the day came late when we were getting close to the take out. A nice fish swirled in the deepening shadows along the bank. The cast was right where I wanted it and the fish pushed a wake as it came to investigate. The fly disappeared in a swirl and the fight was on. I knew immediately that this fish was in a different class than the ones we had been catching. As I fought the carp up and down the river, David P. rowed after the fish, providing a great opportunity to actually land the beast. Finally we neared the shallows, and I jumped out to beach the big carp as there as no chance of it fitting in the net. Two other days I made it down to the river on my own and both times I had excellent fishing. The Caney is fishing well although it will seem really slow now that the cicadas are basically done. 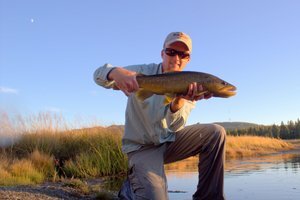 Large trout don't show up as often when the game consists of nymphs and midges but its good to know they are in there. The Caney should continue to fish well assuming that there is enough cold water in the lake to last through fall. The recent heavy generation may start letting up soon although the heavy traffic on the river makes fishing it a less than appealing proposition. ...on cicadas!!! I've been on the Caney for the past couple of days and likely to get out again another day or two in the near future. The cicadas are on but definitely winding down now. All this time I thought trout fishing was a blast, but now I sort of understand why some people get all excited about carp. These fish were chowing down on cicadas on the lower river. Here is one picture of a 30 inch carp caught during a float with David Perry. Lots more to come over the next few days so stay tuned for more on the cicadas and the big browns, rainbows, and yes, carp that are tearing them up.